Welcome to a new-ish online blogging event: the Fantastical Food Fight coordinated by Sarah of Fantastical Sharing of Recipes. For more information about the event, click here. I missed last month - boo! - because I haven't had a chance to unpack my slow cooker. So, I definitely had to jump into this month. This month, we were given the challenge of dipping things in chocolate. So. Many. Possibilities. But before you dip, you must temper. Tempering chocolate is a crucial step for making smooth, glossy, evenly colored coating for your dipped chocolates. Tempering prevents the dull, greyish color and tough, waxy texture that happens when the cocoa fat separates out. Tempered chocolate produces a crisp, satisfying snap when you bite into it. Place half of your chocolate in a double-boiler and, over low heat, warm until melted. Remove from heat and stir in the other half of the chocolate. Set aside until the chocolate begins to lose its shine; it's beginning to crystallize. Then, return the chocolate to the double-boiler and warm, over very low heat, until smooth and glossy. Baci di Ficchi. Fig kisses. I have loved these ever since I had them at the girl + the fig in Sonoma. This is so easy it's almost laughable to write down a recipe. Figs + melted dark chocolate. That's it. Enjoy. Temper the chocolate and line a baking sheet with parchment paper. 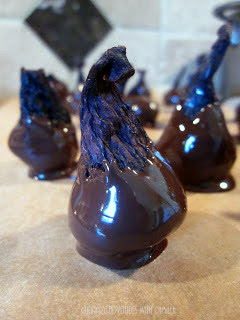 Holding the figs by the stem, dip the bulbous end in the chocolate. Gently shake off any excess chocolate and place on the parchment paper to set. Once the chocolate is set, keep in an air-tight container...or just eat them right away! I love figs...I have dipped dried apricots before and they were lovely but didn't think of figs.....picking some up next shopping trip! Thanks for sharing about tempering chocolate! Super handy dandy for the next time! These figs look delicious too! Thanks for much for the tempering lesson! I tend to cheat by adding shortening. This is much fancier! I need to figs this way. YUM! Beautifully done! I have yet to successfully temper chocolate! I've never had chocolate dipped figs! Will have to try. They came out delicious looking!